As members of the local Mars Society and NSS chapters, my family was invited to a “friends and family” preview of Star Trek: The Exhibition at the San Diego Air & Space Museum. It’s an exhibit we had intended to see anyway, but seeing it on opening day with a bunch of other fans and space enthusiasts was too good to pass up. 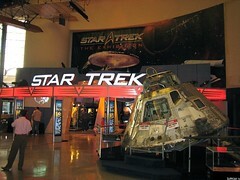 The short summary: It’s a fun exhibit for fans of TOS or TNG, or fans of the Trek universe in general. It’s worth going just for the chance to sit on the Enterprise bridge or stand on the transporter pads. More of my review after the jump, including photos and a short YouTube clip.